Hardwood floor installation Mecklenburg County expert, adds beauty and value to your home.Hardwood floors can give your room a natural, classic look when done right. Hardwood floor installation will also increase the resale value of your home. Variety – Hardwood floors offer maximum choices in appearance. There are many colors, styles, stains, and species available. You can also choose pre-finished or unfinished hardwood floors. No matter how diverse and unique your needs are, there is always a hardwood flooring option available for you. Improved Indoor Air Quality – Hardwood floors are the optimal choice for those with allergies. It has no fibers, grout lines, or embossing that can trap dust, pollen, particles, animal dander and allergens that carpeted floors can. High Quality Look – Any room can look warm and more spacious with a hardwood floor atlanta foundation. Hardwood floors give an elegant aesthetic and high-end look. The beauty and value of wood never goes out of style. Strength & Durability – High quality hardwood floors that are kiln-dried, manufactured, installed, and finished to certain standards can last for generations. Hardwood floors are tough, hard-wearing, and have long term durability. They can stand up to active workspaces and heavy foot traffic. Easy to Clean – Hardwood floor surfaces are very easy to clean as they do not accumulate a lot of dirt, dust, and debris. A weekly cleaning procedure involves vacuuming, mopping and keeping the floor dry. That is it! 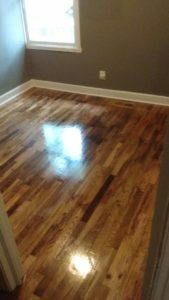 Are your hardwood floors are faded, dull, or scratched? Do you wish they were a different color? Before you install new hardwood flooring, you may want to consider refinishing or “restoring” your existing floors. Mr. Hardwood can restore the shine and luster of your floor and even give it a new appearance while protecting it for years to come. We give you a 100% unconditional satisfaction guarantee, every hardwood floor refinishing job we do you are going to have the very best. Expert Flooring Repair & Restoration– We can fix small scratches, warped boards, and even repair or replace large damaged sections of your floor. Wide Choice of Stain Colors – We use only the best Minwax stains. Your existing floor color can be matched or we can give it a whole new look. Dustless Sanding – Our 99.7% dustless sanding systems keep your home clean throughout the process. Odorless, Eco-Friendly Finish – Our highly-resilient sealants protect your floor and is safe for your family and the environment. We provide a professional renovation and installation services with a real focus on customer satisfaction. Our installations are carried out by fully trained staff to the highest professional standards. We can help you bring new life to your existing property. We will manage your project from initial design and project specification to deliver a turnkey high end finish.